SCVHistory.com LW3245 | William S. Hart | Lobby Card: 'Tumbleweeds,' Original Release 1925. 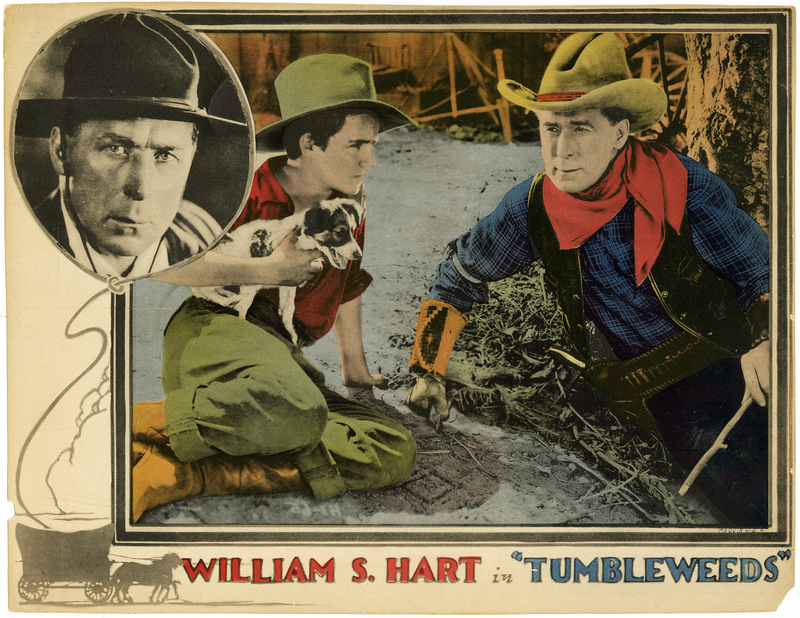 Lobby card advertising United Artists' original 1925 release of "Tumbleweeds" starring William S. Hart. Card measures approx. 10¼x13¼ inches, so it has been cut down from the original 11x14 inches — which is a shame, but fortunately the full image is there. It's only missing some of the white border. Color Hart cards are relatively rare, possibly because, by time lobby cards started to be printed in color (around 1921), Hart wasn't the big box-office draw he was in the late Teens and the studios were actively suppressing his films, to his chagrin. He even sued United Artists for failing to promote and distribute "Tumbleweeds" to his satisfaction — so it stands to reason that there weren't enough lobby cards printed for it. Not for lack of desire on Hart's part, "Tumbleweeds" would be his last film. It is his best known film today, only because of a re-release that came 14 years later, after the lawsuits (and Hart's career) were finished, which included "The Thrill of It All," his farewell to the screen. The 8-minute, spoken-word monologue was tacked on to the front of the picture and enabled audiences to hear him in movie theaters for the first and last time. LW3245: 9600 dpi jpeg from original lobby card purchased 2018 by Leon Worden.